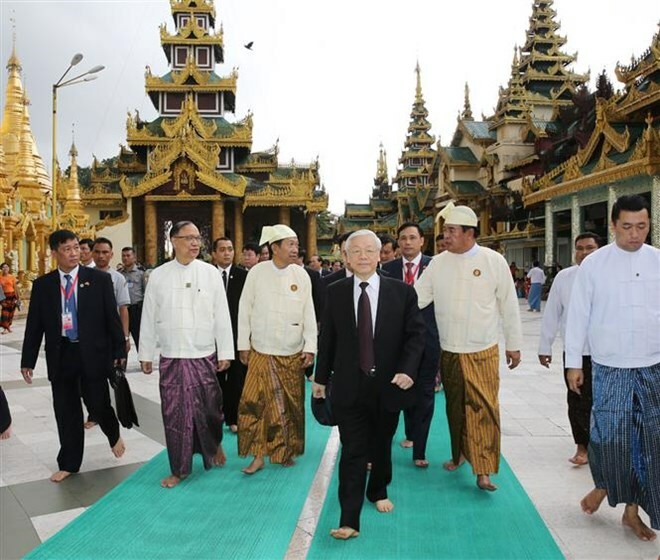 Yangon (VNA) – Party General Secretary Nguyen Phu Trong welcomed the establishment of the Myanmar-Vietnam Friendship Association in July this year and asked the association to assist with the implementation of bilateral agreements. He made the comment while receiving Chairman of the association U Tint Swai in Yangon on August 26, as part of his current State visit to Myanmar. Underscoring valuable traditional ties between the two countries, the Party chief said Vietnam appreciates Myanmar’s support during her past struggle for national independence. He noted his current visit aims at elevating bilateral relations to new heights, adding that the two sides have issued a joint statement on establishing a comprehensive cooperative partnership to reinforce cooperation in politics, trade, security-defence, and people-to-people exchanges, as well as at regional and international forums. Trong said he hopes the two countries’ friendship associations will share experiences and hold people-to-people exchanges to boost mutual understanding and amity between the two nations. For his part, U Tint Swai expressed his delight at growing Vietnam – Myanmar relationship. He said his association needs to learn from Vietnamese partners via experience exchanges on international cooperation. He said his organisation plans to admit Vietnamese investors in Myanmar as members and to work with its Vietnamese counterpart to intensify bilateral friendship activities. The chairman pledged to do his best for increasing the engagement between the two Governments and their people.